Some days we come across things that surprise us. The other day Homer found a turtle in the road and stopped, picked it up and brought it to the farm. The shell of the turtle had an old but prominent gash in it..probably where a lawn mower hit it. Here it will be able to move out of the way of the cattle with time to spare. Then this appeared in the clover one day. He thought it was a hose that had been misplaced..to discover it was alive and moving. 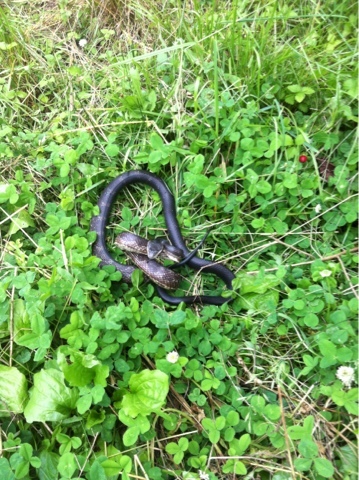 Black snakes eat rodents, so it gets to go live in the high grass too.